to David Bentley Hart for his book 'Atheist Delusions'. 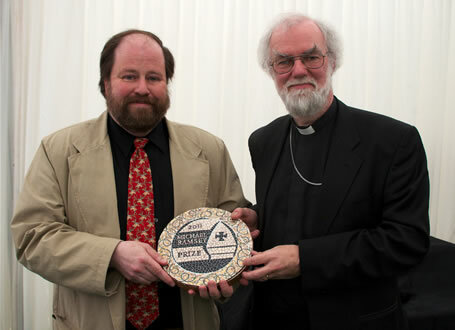 The Archbishop of Canterbury, Dr Rowan Williams, awarded the 2011 Michael Ramsey prize to Atheist Delusions by David Bentley Hart at a gala lunch at the Telegraph Hay festival. Speaking about the winning entry, Dr Williams said it "takes no prisoners in its response to fashionable criticisms of Christianity". On receiving the prize David B. Hart said "Needless to say the honour is very great. For me, it lies especially in the name of the prize - as I have such a high regard for Michael Ramsey - and in its being conferred by the current Archbishop of Canterbury - whose work is among the richest theology being written in English today".